When we first got into the sport of distance riding, we were no Einsteins, that’s for sure. 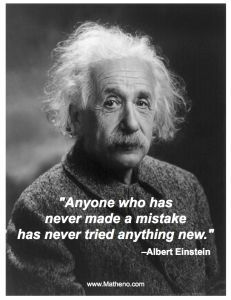 But we certainly had his enthusiasm for mistakes! Let me tell you about our first competition. It was a 20-mile Novice Competitive Trail Ride sponsored by OAATS, near Akron, Ohio, a mere 3 hour drive from home. Our sum total of formal education in the sport was watching Mollie Krumlaw-Smith teaching a brief segment at Equine Affaire in Ohio several months prior. Richard was competing on his barely 5 year old Arabian, Shantih. I had my 4 year old draft cross mare, the one I’d purchased to do some lower level dressage with, Tess. To say that Tess was a drafty girl would be like saying Shantih was “green broke.” Both are the kindest possible descriptions. Richard had purchased a “custom made” saddle for endurance. It was a thing of beauty. Did it ever really fit Shantih? I kind of doubt it, but by the time he was six and had gone from a spindly creature to a broad specimen, I guarantee you it did not. We bought a used truck camper, entered the ride, left after work on Friday so that we could settle in and relax on Saturday and then compete on Sunday before driving home. I neatly organized my clothes for the weekend and left them folded on our bed. They never made it to the camper. We got a little confused on the directions to the ride camp, got lost (and almost broke up right there on the highway outside of Akron), and arrived at camp so late that no one was there to greet us. So we just parked out of the way, tied one horse to each side of the trailer with a hay net full of hay and a bucket of water, and called it a night.